Binary Scam Alerts » Scam Reviews » Signal Snipe Review, SCAM Forex Signals Sniped! The Signal Snipe Forex signals software (not to be confused with Signal Sniper) is a confirmed and BLACKLISTED SCAM. Our detailed review and investigation will provide conclusive proof and evidence of foul play and once more leave you with a bitter taste of disappointment. If you have placed your trust with this fake signals provider and invested money to join the program you had best start inquiring about a refund, since these liars spared no expense at crafting a fraudulent piece of software which is at best designed with flaws, and most likely a malicious app which steals money. Today we know there is nothing legit or genuine about this system, and you will end up having your wallet fleeced. Our team of researches has produced valid and substantiated proof of SCAM, so let there be no room for doubts or hesitation. Keep reading to see how we exposed Signal Snipe. Below you will see the seemingly harmless sales page of the Signal Stripe Forex trading software. They claim they deliver “profitable signals directly to your inbox”. They also present themselves as a team of experienced professionals who are passionate about Forex analysis and trading” and care about their subscribers with whom they share market information with. Sounds promising right? But how far are these liars willing to go to make you buy their system? Here’s your answer, and it’s in the form of fake testimonials. These crooks are using stolen or rehashed images from image banks in order to create a convincing and trustworthy environment. But as you can see, the exact opposite is the case and it is very clear to see. 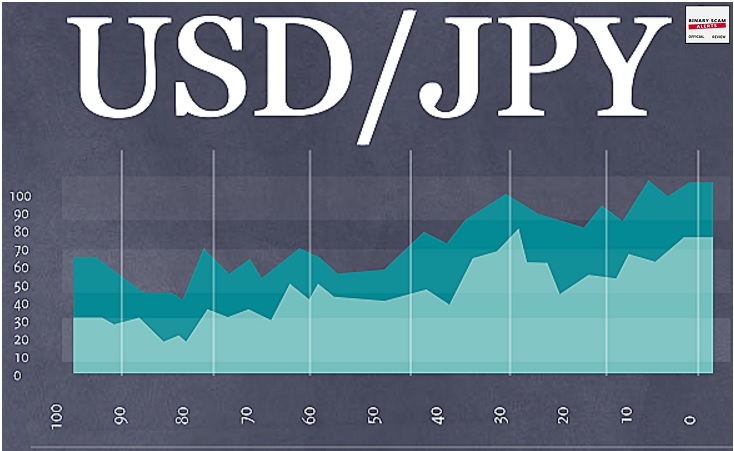 This Forex signal software supposedly analyzes currency pairs. As you can see it looks very convincing and professional to the naked eye, however we asked around and found out that these signals are not accurate at all. In fact, the results are random at best and you would be better off flipping a coin. 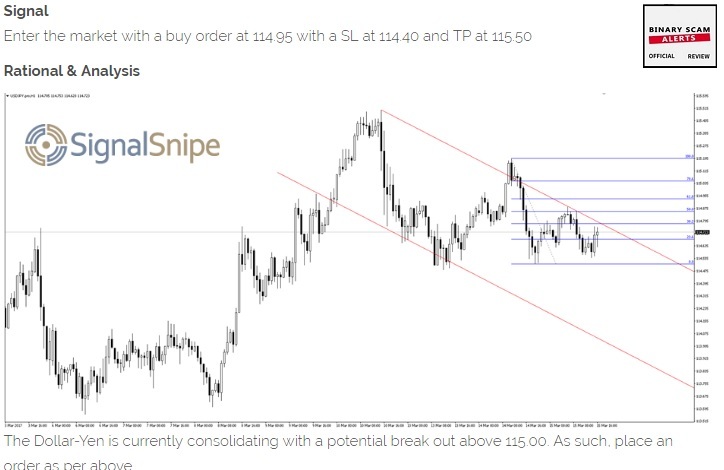 As you can see in this image, the technical analysis states that the Dollar-Yen is consolidating with potential break out above 115.00 and the recommendation is to place an order accordingly. This is a subscription based software which will cost you $60 a month. It’s not that much so even if you get scammed it’s more of a disappointment than a fleece. Just make sure you use use a prepaid card if you absolutely feel you have to “test the waters”. We have not seen any reviews about this software, but after we expose it today we are sure there will be others who “suddenly find it” and review this fraudulent software. The ones getting the most complaints are Omnia App and Code Fibo. If you are deliberating and not quite sure how to proceed we understand your frustration. Our recommended section lists a very short selection of apps that have been around for a long time and produce results consistently. Signal Snipe is a fake signals software and service and we believe it is a SCAM so we blacklisted it in our impartial review and investigation. Truth be said, while the software is inaccurate and signals are misleading the cost very low so it won’t put such a dent in your pocket. We did however make sure to use a prepaid credit card, this way they can’t steal our money or not allow us to discontinue our membership. We believe that this app was designed very quickly by an offshore programmer who may or may not have it connected to an MT4 data feed. And even if this is the case, the data is either random or delayed significantly so it’s useless. If you believe this software is legit or genuine, you will most likely be disappointed but it’s a cheap lesson learned so don’t get too depressed and start using alternative software we recommend. As always, we invite you to join our Facebook Group and YouTube Channel and to get educated.